I received and email from who I can only assume is either the race director or marketing director for an inaugural new race in the Austin, TX area the other day. Now, it wasn’t something that was directed toward me as a blogger, it was just something that was sent out to everyone that participated in the Schlotzsky’s BunRun last year. The BunRun usually happens like the last day of April every year and has always been somewhat of a harbinger of springtime in central Texas. 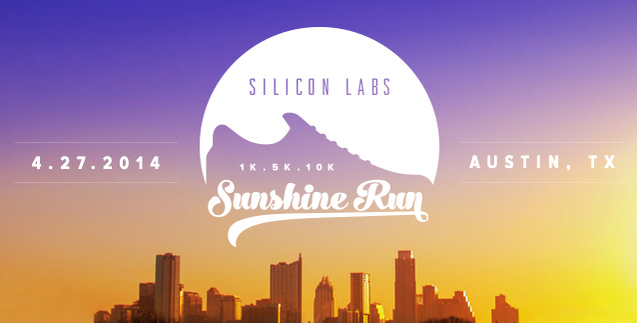 However, this year is the inaugural Sunshine race sponsored by Silicon Labs. It’s happening the final Sunday in April, the 27th…which is when the BunRun would have normally happened. I hadn’t realized all this yet, not even when I looked at the course map and saw that it was the exact same course as the BunRun. Then, I saw a link for a press release that said something about the BunRun being rescheduled for the fall. So I clicked on that and read that they were moving it to the fall, date and route to be announced still, and were adopting a new beneficiary for their charitable donations that they collect through race registrations. 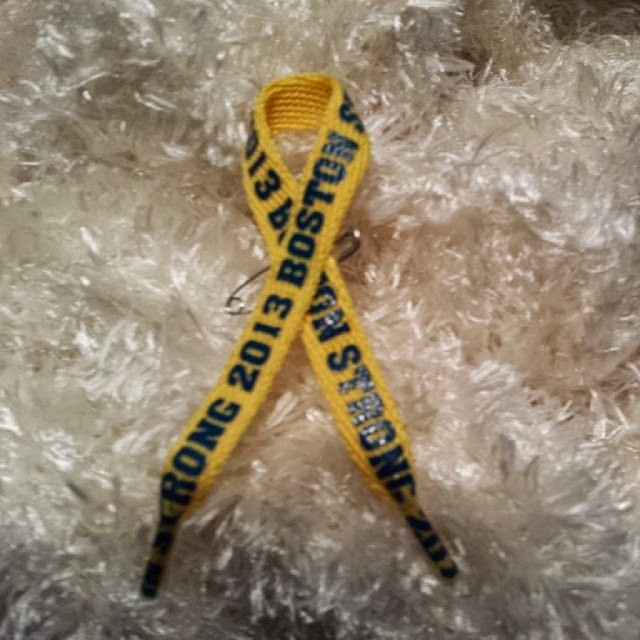 By moving the BunRun to the fall, they made way for a new race, the Sunshine 1K/5K/10K. The 10K is $45 and I’m thinking of doing it. I’ll have 1 week off between my 3-week racing spree and this race if I do it. I’ve got a deep tissue massage planned for the 20th that will focus on my calves and hamstrings and then my shoulders and shoulder blade areas. Then, after that, I’ve got a 5K on May 10th and an 8K on May 25th…then my vacation half marathon on June 7th…then nada until September. My days off changed at work this week. I did have Sundays and Mondays off, now I have Saturdays and Sundays off. WOOHOO!!! This is great news for my running career. It means I no longer have to request a vacation day on the Saturdays before a race day. So, for my running this week, I ran the Biggest Loser half marathon (race report forthcoming, don’t fret!) on Sunday, then I took Monday and Tuesday off to recover. I did a LOT of running around and got a lot of errands done between Monday and Tuesday. I had originally planned to run Wednesday and Friday mornings for 3-3.3 miles each day. Well, I picked up a shift of overtime for Thursday which meant no run Friday morning, so I decided I would just run Wednesday and Thursday mornings. Well…that was all well and good until Tuesday night at work when the overnight supervisor asked if I wanted to work Wednesday night. Soooo…plans changed AGAIN. I decided that I would run 5 miles Wednesday and call it good. While running that 5 miles, I decided I would do a little 2 mile “shakeout” run Saturday morning before I head to the expo for the Capital 10K to pick up my race packet and do some shopping. I slept late this morning, as planned, just a little longer than I had originally planned. I got up, ate a banana and headed out for that 2 mile "shakeout" run. I'm not sure how you're supposed to run a "shakeout" run, but I ran that 2 miles as fast as I could sustain. So, that meant 9:31 for the first mile and 9:38 for the second mile. After that, I cleaned up and went to the expo. It was SMALL. Last year, it was held at the Austin Convention Center and it was fairly decently sized (read: huge and well stocked). This year, it was held at the Palmer Event Center and was, as I said, SMALL. I don't know if they had problems getting vendors to sign up for the expo or what, but I was severely disappointed. I didn't stay long, but that didn't keep me from spending money...no sir! 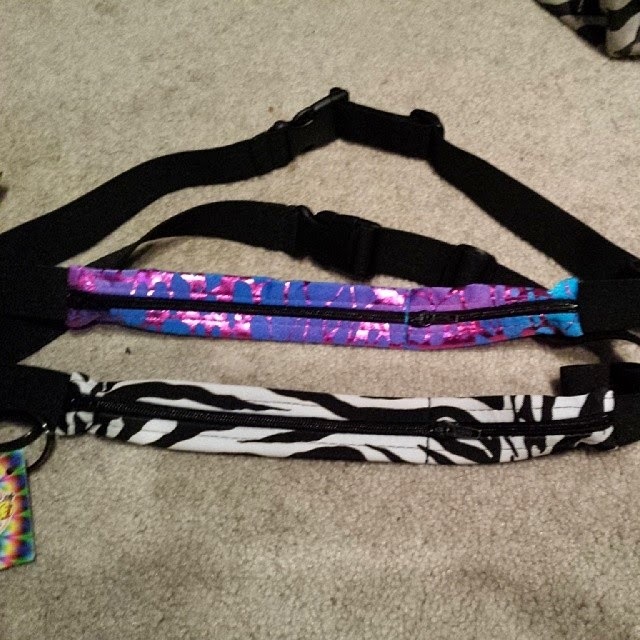 Hippie Runner was there as I had hoped they would be, so I bought 2 new gear belts. 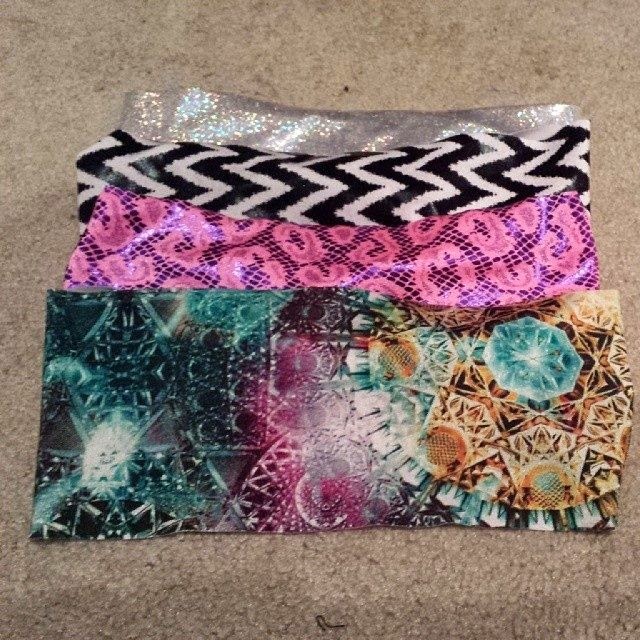 I also bought me FOUR MORE headbands from BondiBand (ha! like I needed any more!). I got some new sunglasses. now I can be all matchy-matchy with more running outfits! 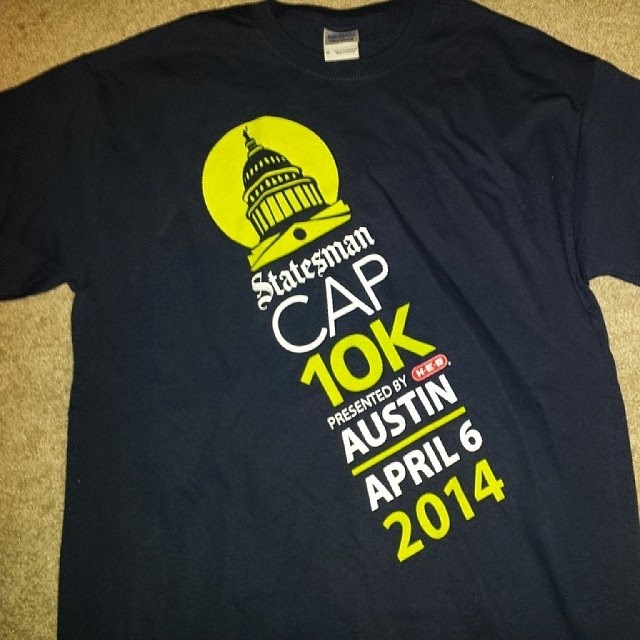 I’ve already decided on my outfit for the Capital 10K…well, for the most part. I know I want to wear my “Keep Calm And Run On” grey tank top and I’m thinking of wearing my Wonder Woman tutu with it. Lots of people dress up for this race, so I would fit right in if I did that. If I don't do the skirt, I have a pair of black and white leggings that would look great. I'll just wear some spandex shorts underneath them. I finally got my final picture I needed in order to put together my Austin Half Marathon page in my scrapbook...the one of me ringing the PR gong! So, now I am almost all caught up in my scrapbook...just waiting on the Biggest Loser photos to post to their website. I sent them a message. It's been a week, the pictures should be posted by now. 1. Do you have a favorite board game? 2. Do you have a favorite card game? 4. Do you prefer the x-box, playstation or wii? xbox, because I have one. I used to have a wii and, really, I didn’t like it all that much for anything other than the Mario cart game. nope. I don’t really understand it. But I have a friend or two that does it. yes, I do. So, when I bought the puzzle recently so I could use a few pieces to glue to my scrapbook page for my Autism Speaks 8K that I ran last year, I had to make sure it wasn’t a puzzle that I was going to lament over not being able to put together. I bought a tweenie-bopper puzzle, so there was no desire for me to put this puzzle together. I picked it strictly for its bright and rainbows of colors. I’ve taken lots of classes for my work, but nothing just for the fun of it unfortunately. I would LOVE to take a writing class and/or an art class. for a whole year i was holding onto my bibs in a clip magnet on the fridge. 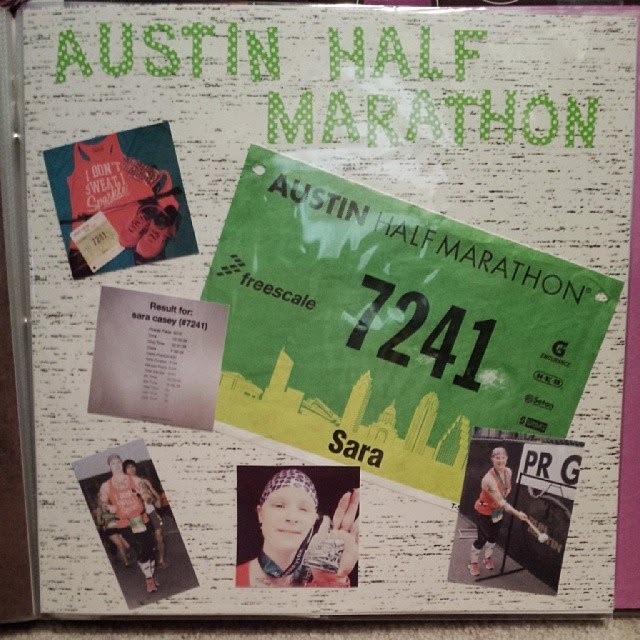 i thought about getting a bib holder, but then i saw something about a bib album and then a thought dawned on me...why not scrapbook my bibs with photos from each race? brilliant! i love it and, now, i love scrapbooking!